As kids, me and my sister had numerous sets of "Fuzzy Felts" to play with. Shapes cut out of felt that would cling to a roughed up material board by the power of friction alone! Astounding technology, those toys of the 70s and 80s! We loved them so much. I can remember a circus set, a zoo set, a ballet and theatre set and several mismatched odd ones that my mum had picked up at jumble sales too. My nostalgia led me to make my older daughter a personalized Fuzzy Felt set for her third birthday. It was a bit of a rush job, but I think it turned out fairly decent. On the computer I cropped out the heads of her preschool friends and aunties and uncles from photos and slapped on cartoon bodies for a bit of cutesy humor. 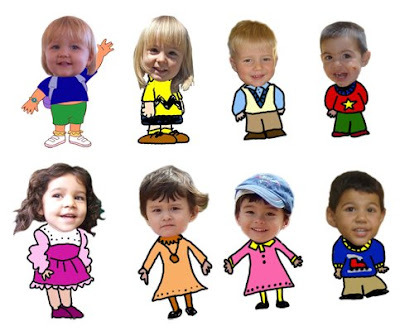 Some had the bodies of Charlie Brown or Dora the Explorer, but then I started having fun just drawing simple little child like bodies on the rest. I printed these little people out onto tshirt transfer paper and ironed them onto white felt and cut them out. 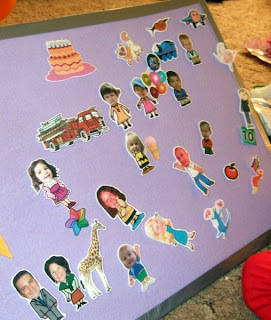 I also made some random birthday themed felts and a few of thier favourite characters like Charlie and Lola. The boards were made from cardboard with a weird rough mat/felt material stuck to them that I found in a Japanese store completely by fluke. I have no idea what this material was actually intended for, but it works really well for maximum felt friction fun and was dirt cheap. I gaffer taped the edges of the board, but if I'd not been in such a rush making it the night before her birthday then I'd probably have got an old picture frame from Goodwill or something to put it in. 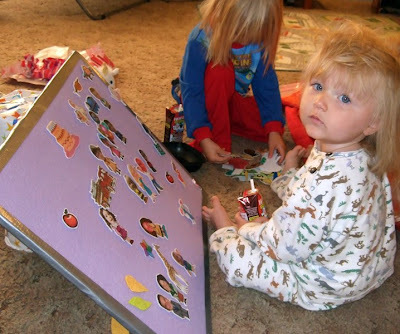 Here is a pic of the kids with bedhead playing with it the next morning. 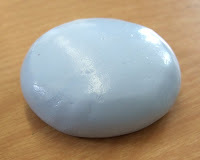 A mate of mine had a pretty old book that she got from a garage sale that had a recipe in it for homemade silly putty. Great, I thought, lets give this a whirl. Well, the ingredients are deceptively simple (just equal amounts of white glue and liquid starch with a bit of food colouring to jazz it up), but the reality is a little more tricky. Bear with me here. After a couple of botched experiements I came to realise that not all white glue is equal and not all liquid starch is suitable either. 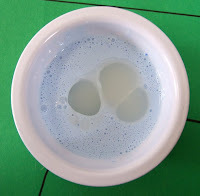 The ones I found to work were Elmer's Glue-All multi-purpose glue (Not Elmer's school glue) and a concentrated liquid starch called Sta-Flo, when the first brand I tried (Niagara) didn't react at all. 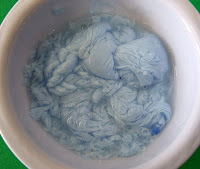 Mixing the glue with the food colouring first is a good idea to get the colouring even, because when you add the liquid starch it makes a big crazy congeled blob and you have to wait five minutes or so for the glue to absorb most of the liquid starch before kneading the resulting putty. Honestly, when you first mix them you'll be thinking, "oh gosh no, that's got to be wrong. 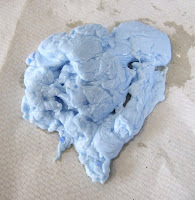 Ew", but it does come together into a great silly putty and I have posted a lot of pictures to prove this to you, in case you feel like you may lose hope and bin the gluppy mess before it reaches it's glorious silly puttiness. So there you can see the progression from pouring the liquid starch into the glue, to after stirring and leaving for 5 minutes, to pulling out of the mixing bowl onto paper towel and finally after about 5 to 10 minutes of kneading in your hands. 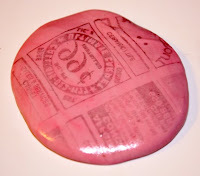 The last pic I have for you is of some pink silly putty we made that shows you can copy newspaper print onto it, just like you could with the original store bought silly putty and also, like that, it bounces when you roll it up into a ball. 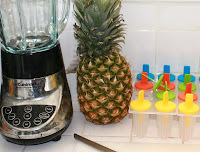 It's one of those things that would be great for older children to make themselves, but I had to make and knead the stuff for my kids because they are only two and three years old. Probably not a good idea for children younger than mine though as I doubt it's snack worthy.